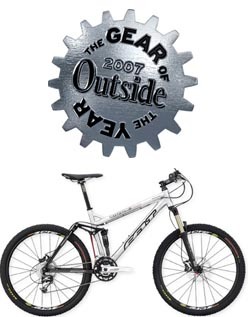 Felt Bicycles is extremely excited and proud to announce that its 2007 full-suspension Virtue 2, with patented Equilink technology, has been named Outside Magazine's mountain bike Gear of the Year! This prestigious designation comes in Outside's just-released 2007 Annual Buyer's Guide. This 200(+) page perfect bound piece from what is widely considered the world's preeminent outdoor source, hit newsstands April 24 and will remain on display all spring and summer, and through October 1. Using patented Equilink technology, the Felt Virtue 2 shares the identical design platform - which completely separates and isolates the drivetrain from the working suspension - as the rest of the Felt Virtue family including Virtue models 1, 3 and 4. To see the details of Equilink technology log on to: www.feltracing.com/tech/equilink.asp. "The Virtue II debuts a radical new suspension system (dubbed Equilink) that offers more than five inches of active travel but has none of the drawbacks - no pedal feedback, no bob, and no extra weight - that plague most long-travel systems. It's super-plush and, amazingly, still handles like a hardtail." "The Equilink system rides superbly yet requires virtually no TLC." "The value can't be beat...everything on this bike is built to perform well in all conditions - for years to come." "The Virtue performed just as well on technical trails with television-size boulders and three-foot drops as it did on buffed out singletrack with whoop-de-do rollers. Credit the Virtue's geometry which rides firm - stretched out forward, and hard charging - yet still feels stable and cushy in the rough." In conjunction with being named Gear of the Year, the Felt Virtue 2 will begin a 3-city tour with the magazine called The Outside Buyer's Guide Gear Experience. This inaugural Stay 30 Forever Tour will visit three urban markets this month - designed to help unlock the secrets of preserving a healthy active life and beating the clock with everything from stamina to state of mind. The 30 x 30 Buyers Guide tent will offer consumers a hands-on experience with the best gear on the market. The Felt Virtue 2 has a MSRP of $3499 and is available exclusively through Independent Bicycle Dealers throughout the U.S. For a complete dealer listing log on to www.feltracing.com. Felt Bicycles LLC is a designer, manufacturer and distributor of its own propriety branded premium quality bicycles, framesets, components and accessories. The company headquarters is located in Irvine, CA with additional offices in Buffalo, NY and Edewecht, Germany. Felt Bicycles is an internationally recognized brand whose bicycles and products are currently sold in over 30 countries, worldwide. Athletes on Felt products have won numerous National and International events including World Championships, ESPN X-Games and other major national and international competitions. For more information on Felt Bicycles call (949) 452-9050 or log on to www.feltbicycles.com or www.feltbmx.com.